If there is one Bordeaux property that deserves its ‘Super Second’ status, it is Château Montrose. This renowned estate, located in the Saint-Estèphe appellation, consistently produces some of the Bordeaux’s best wines every year. It is also one of only a handful of producers in Bordeaux to earn 100 points from Robert Parker in both 2009 and 2010. But the excellence of Montrose goes well beyond these two vintages, which is tied to its prime terroir and vast history. With this in mind, we were very pleased to attend a dinner and tasting with Hervé Berland, the Managing Director of Château Montrose, held at Michael Mina’s Stripsteak restaurant in Miami. The dinner included wines from Château Monrose, Dame de Montrose, and Château Tronquoy-Lalande (also owned by the Martin Bouygues of Montrose). The event was sponsored by Best Wine Co., a negoçiant firm that specializes in high-end Bordeaux wines. Mr. Berland started the evening by offering a few words about Montrose, its terroir and its history. He discussed his role as Managing Director, and why he came to Montrose in 2011. Prior to Montrose, he was the Managing Director at Château Mouton Rothschild for many years. He has certainly approached his new role with both passion and dedication. Among the topics discussed were the prime location of the gravelly terroir, atop the hill overlooking the Gironde Estuary. Of course we discussed the wines of Montrose as well. He has quite a bit of enthusiasm for the most recent vintages, especially 2016. He described the near-perfect conditions during 2016, and is very optimistic about the wines to be produced. He drew comparisons to both 2005 and 2010, two exceptional vintages at Montrose. We also discussed the massive renovations that were recently completed at Montrose. This included the creation of perhaps the most impressive barrel cellar in Bordeaux. Having recently visited Château Montrose, I can attest to the superb design and impressive facilities throughout the property. Mr. Berland told me that they are currently renovating their vat room, switching to smaller vats so that they can vinify individual parcels from the vineyard. As successful as Montrose has been in recent years, it is commendable that they continue such massive investments in their facilities. It is this type of dedication that leads to the fantastic wines that are produced in Bordeaux today. Paired with dishes such as lamb chops and steak (of course), we enjoyed a number of excellent wines. First up was the 2013 Château Tronquoy-Lalande blanc, which was quite impressive. This was very popular among the attendees, and is an extremely smooth wine. We then tried the 2012 Château Tronquoy-Lalande rouge, which is a nice red Bordeaux wine for early drinking. We moved on to the 2011 Château Montrose, which showed a step-up in complexity. Having tasted a number of 2011 Bordeaux wines over the past two years, it is apparent that these wines are started to soften and become approachable. This 2011 Montrose is definitely approachable now, but will need several years to show its true potential. Mr. Berland noted that this vintage is often overlooked, due to the stellar 2009 and 2010 vintages, but that it deserves far more attention. Next we tasted the 2012 Dame de Montrose, the second wine of Château Montrose. Being more Merlot-based, this wine was soft, fruity, and quite charming. These are known as some of the best second wines in Bordeaux, and for good reason. We then tasted the highly acclaimed 2005 Château Montrose, which I felt was the most impressive wine of the evening. Despite its obvious complexity, it is only starting to show its potential. This is a wine that will drink well for decades. We finished the evening with the 1998 and 1986 Château Montrose. The 1998 was enjoyable, but lacked some of the concentration and complexity of the 2005; however, it is ready for business, and has shown improvement since I last tasted this almost two years ago. The 1986 vintage, provided by one of the attendees of the dinner, possessed the charming aromas and flavors found in aged Bordeaux wines. But it is obvious that the 1986 vintage does not possess the sheer beauty and poise of the 1989 and 1990 vintages that soon followed it. This fantastic evening perfectly demonstrated the consistent excellence of Château Montrose. The dedication and passion of Mr. Berland should help to maintain the excellence at Montrose, and perhaps propel it to even greater heights. Perhaps this will become apparent with the most recent 2014, 2015, and 2016 vintages. But as the wines of Château Montrose are known to be some of the longest lived in Bordeaux, tasting these excellent wines in their youth provides only a glimpse of what these wines will eventually become. One thing is for certain; the investments and leadership at Montrose should help them to maintain their ‘Super Second’ status for the years to come. 08-14-2015 St. Julien VS St. Estephe Tasting at Wine Watch, Ft. Lauderdale. One of the great things about the wines of Bordeaux is their many diverse styles, even among close neighbors. Much of this diversity is not just due to differences in winemaking styles, but also the variations in terroir. It is pretty amazing to think that soil differences, slope elevation, or the relative proximity to the Gironde estuary can really create subtle differences among the wines. For this reason, we were intrigued to participate in a tasting that compared selected wines from two appellations of the Haut-Médoc, St. Julien and St. Estèphe. Within both appellations are some of the great wines of Bordeaux, many of which were showcased in the tasting, held at the Wine Watch Boutique in Fort Lauderdale, Florida. And just to make it more fun and interesting, we decided to turn the tasting into a battle of sorts, with each appellation pitted against the other. 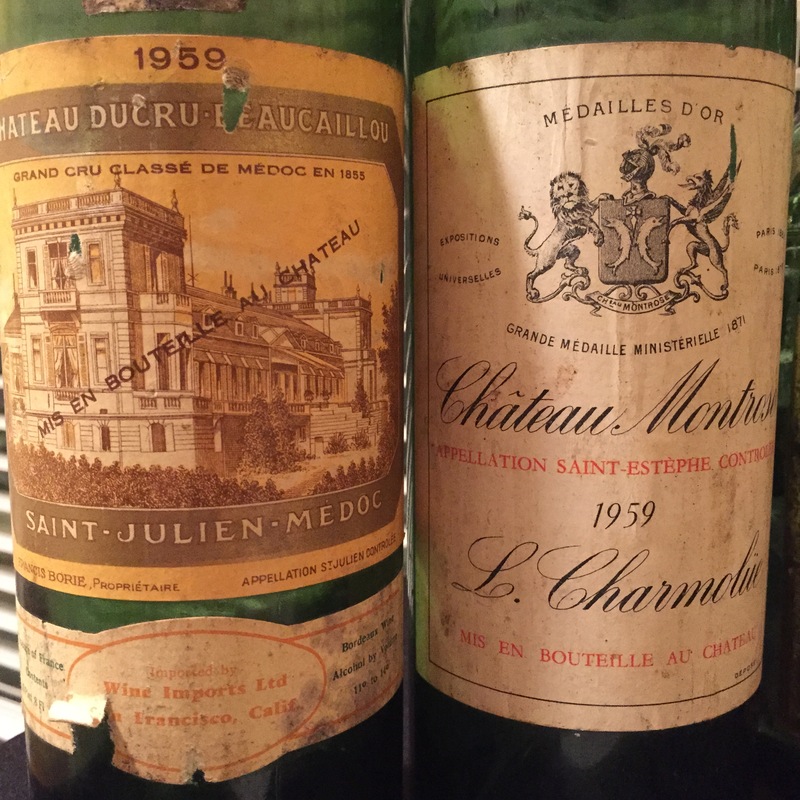 1959 Château Montrose vs. Ducru-Beaucaillou…St. Julien vs. St. Estephe round 1. Starting with the Ducru, some thought there might be some TCA taint, but I didn’t detect any at all. Instead there was some brett (but not powerful) and lots of dusty aromas. Funky, medicinal, dried herbs, dusty old library books, but dark fruits struggling to stay alive. Amber-brown with still good concentration. Completely resolved tannins. We both liked it, but if even a hint of brett turns you off, don’t attempt this ’59 Ducru. The ’59 Montrose was still powerful and not at all austere (as some like to pigeonhole St. Estèphe). Nice garnet color and fragrant aromatics, with cassis, soy, leather, soil, and spice. Drinking quite well for a ’59, with a smoothness and beautifully balancing acidity. Impressive concentration and length on the finish. There is still lots of life left here. So the winner goes to St. Estèphe in round 1. 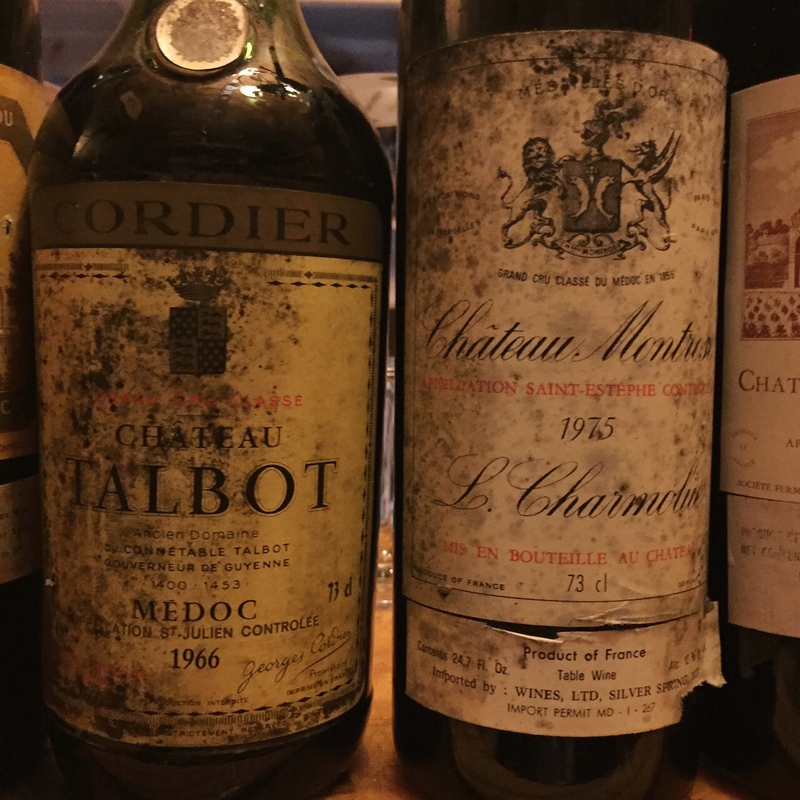 1966 Château Talbot vs. 1975 Château Montrose…St. Julien vs. St. Estèphe round 2. It was interesting trying the ’66 Talbot a week after trying the ’64. The ’66 beats it in complexity and current drinkability. Dark and red fruits, truffled toast, leather, and old library book. Has a bright acidity, but the flaw in this wine is that it was a bit tart on the finish. Still an enjoyable mature claret that is probably on its final descent. The ’75 Montrose, on the other hand, did not impress much and lagged big-time behind the ’59. Cassis, leather, and green pepper. Still fairly tannic with high acidity. An austere wine that is not particularly anything to write home about. Round 2 goes to St. Julien. 1982 Château Cos d’Estournel vs. Château Gruaud Larose…St. Julien vs. St. Estèphe round 3. The biggest smack-down of the evening. The room was divided on which was the ‘better’ wine. Starting with the Cos, this is more evolved aromatically than the Gruaud. Dark and red fruits, roasted meat, leather, brown spices, clove, damp soil, and green pepper. The aromatic complexity was matched on the palate. Impressive length on the finish with very silky tannins. Something tells me this won’t improve, but it’s currently at the top of its game. The Gruaud Larose (our WOTN) was simply awesome. Dark, concentrated and appearing young at times. Cassis, leathery, licorice, and spice. Mouth-filling, with silky but fairly prominent tannins. Impeccable balance. A stunner. St. Julien wins by a nose in round 3. 1985 Château Gruaud Larose vs. 1989 Château Léoville Barton…both St. Julien, but round 4. ’85 Gruaud Larose had a great nose, one of the best of the flight (as long as a little brett doesn’t bother you). Cassis, hint of brett, olive, black tea, tobacco, anise, and green pepper. Not quite as impressive on the palate but a nice mature claret. In its drinking window. 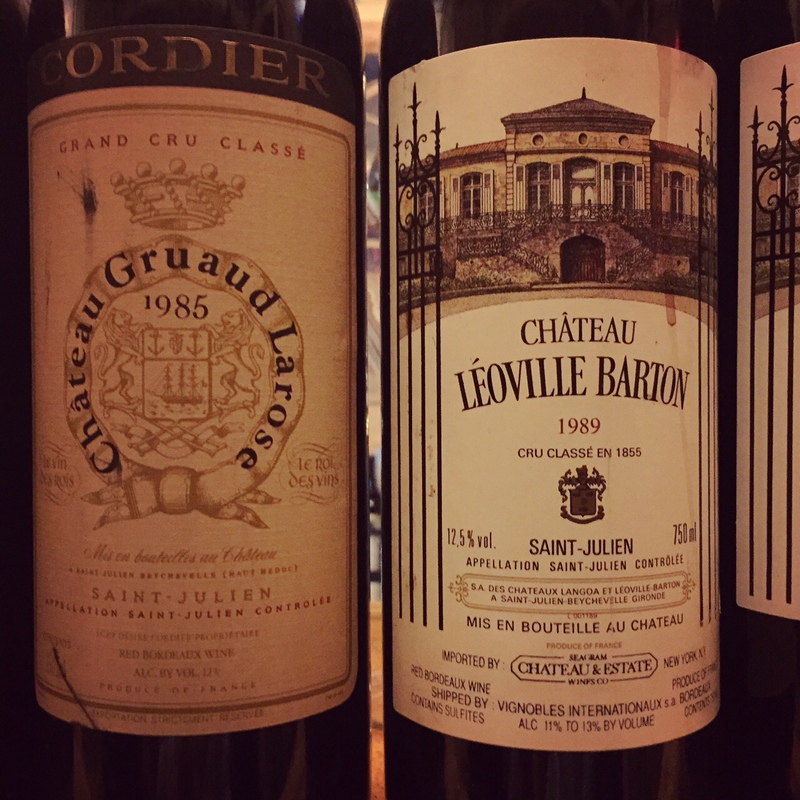 The ’89 Léoville Barton, while not as powerful as many other vintages of Barton, had a nose probably the equal of the Gruaud Larose (but younger with fewer tertiary elements). Dark fruits, blackberry, strong licorice, truffle, and mocha. Smooth drinking, and probably not yet at its peak. How much can it improve? We’ll see. The Léoville Barton probably wins by a nose. 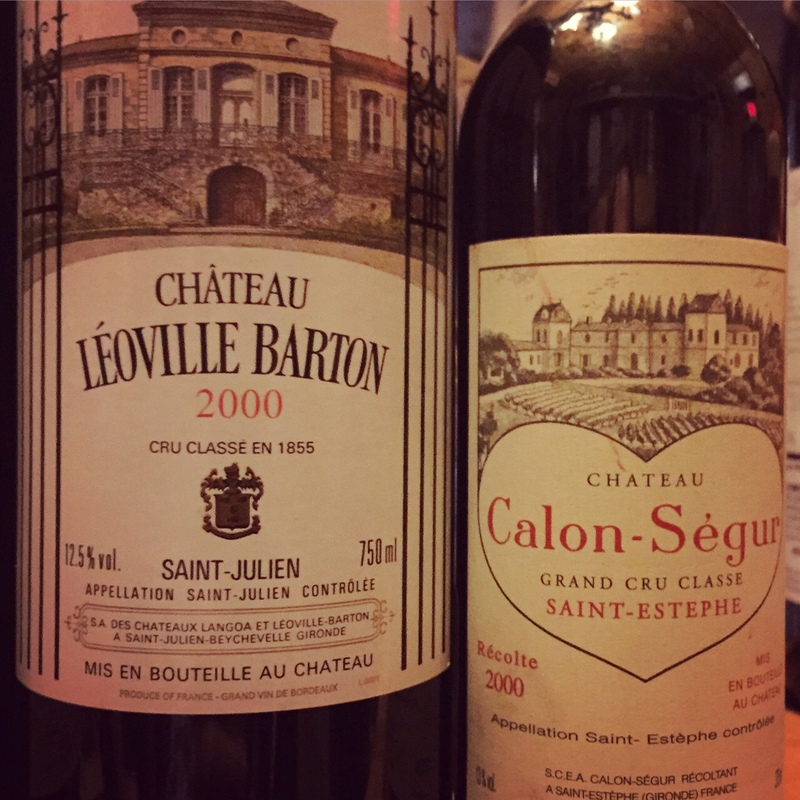 2000 Château Léoville Barton vs. Château Calon Ségur…St. Julien vs. St Estèphe round 5. Can two wines be any different? First of all, the Calon Segur was a 375ml, so it’s hard to really compare these two from an evolution standpoint. The 2000 Léoville Barton was similar to other recently tasted bottled…very young, lots of power and concentration, tannic, serious structure. The Calon Ségur was also very dark, with impressive concentration. Dark/red fruits, tobacco, sweet background oak (think butterscotch), and cocoa. Lush and well-balanced. Hard to call a winner here…but probably Barton due to its potential. In the end, both appellations fared well and were pretty evenly matched. But this was all in good fun, and wine isn’t really about competitions; it’s about enjoyment and savoring every last sip. 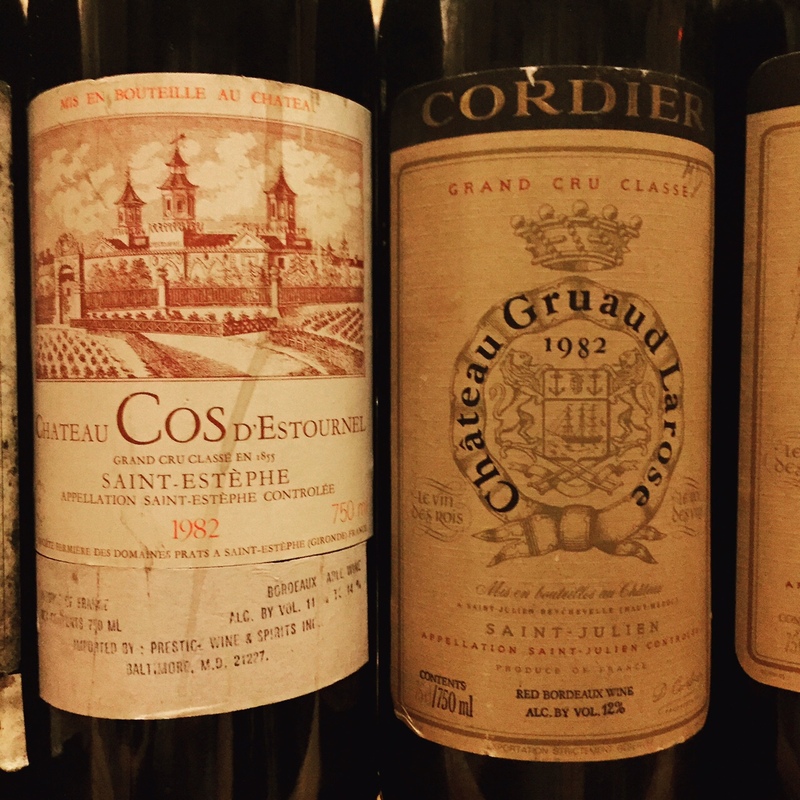 We would be happy to have any of these wines in our cellar…especially that 1982 Gruaud Larose.